Portland Facility | St. Henry Tile Co. In December of 2014, to relieve space constraints that we were experiencing in our expanding precast production, we purchased the Portland facility. This facility is primarily used in production of hog and cattle slats for livestock. 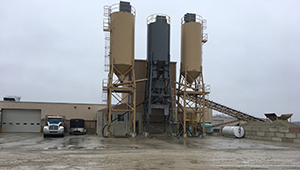 A ready mix concrete plant was added at the location in 2016. Future plans are to add a store front for selling many of our other product lines. Please give us a call at 260-589-2880.